How do people protect themselves from inclement weather? Layer up. That’s exactly what a Transhield cover does for your PWC! Transhield is the 3-Layer Shrinkable Fabric with patented VCI (Vapor Corrosion Inhibitor) for superior storage protection. Transhield covers have a waterproof, shrinkable, outer layer which provides protection from rain, snow, sun, dirt, and other airborne pollutants. The middle layer is a hot olefin adhesive, and the inner layer is a soft polyester nonwoven material to protect against etching and scratching. Whether you’re storing your PWC indoors or outdoors, Transhield PWC covers will protect your investment with minimal effort and high-quality results! - Transhield PWC covers can be made with zippers, Velcro or other components to make installation simple. - PWC Covers by Transhield fit like a shrinkable glove. - Transhield’s non-abrasive, non-woven lining protects finishes from damage. - Moisture is wicked away from the inside environment and transferred to the outside environment in vapor form, preventing mold and mildew development. - Transhield’s reusable PWC cover is a stand-alone product, meaning no bubble wrap, foam, or any other product is needed. - The heat-activated shrinking process provides a tight fit so that the PWC cover will stay snug during transportation or storage. 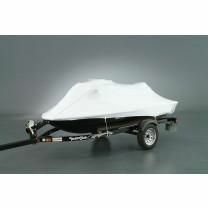 - Shrinking is not required for Transhield covers to protect your PWC, but shrinking is strongly recommended if your cover will be used for transportation purposes. - Easy to apply in just a few minutes. - Transhield PWC covers offer complete, 100% protection, as opposed to spotty protection expected with a patchwork of tarps. - Transhield can be removed quickly and easily. - Transhield PWC covers may be tactfully removed and reused for several years. 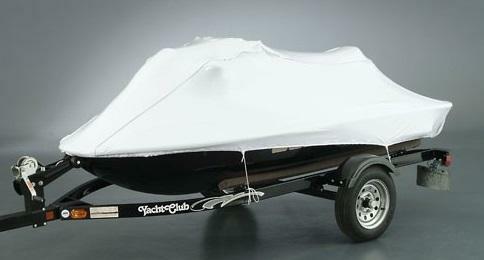 Transhield PWC covers are a great option for protection from the elements during transportation and storage. Reusable PWC Covers by Transhield are easy to install and can be reused for several years! These PWC covers may be heated to shrink for a tight fit, but shrinking is not required. The covers make a great cover for indoor storage as well and are reusable for several years. To quickly make repairs or patches to a damaged Transhield cover, try some Shrink Wrap Tape. If you don’t have a heat tool, you can pick one out for yourself here, or you can Rent a Heat Tool from Mr. Shrinkwrap. Mr. ShrinkWrap is a leading distributor of protective products, shrink wrap for boats and installation supplies with a dedicated team available to take your order at any time of day, we also have several experienced shrink wrap installation technicians on staff to help and support you on various aspects of any shrink wrap project. If you have a question, give us a call at 800-847-5290.